On this episode of Pittsburgh 360, we bring you the third in our “Healthy Baby, Healthy Start” series with a look at how to keep baby safe while they sleep. After that, we'll take you onto the soccer pitch with the Pittsburgh Riverhounds, and we’ll introduce you to an inventor who is bringing the next wave in technology to your skin. Pittsburgh 360: Healthy Baby Ep. 3, A Touch of Technology & Steel City Now Soccer City aired on Apr 25, 2013. Pittsburgh 360: Pittsburgh Ballet Theatre, Duckpin Bowling & B.U.S. We celebrate 45 years of dance and history with the Pittsburgh Ballet Theatre and travel back to the 50’s to do some duck pin bowling. We’ll also join the Bricolage Production Company for their 10th installment of Bricolage Urban Scrawl before meeting a young African American man who is looking to make his mark in the world of dance by starting his own dance company. The animal kingdom is the focus of this episode. We’ll introduce you to a doctor at the National Aviary who is using human medical techniques to develop treatments for birds, a veterinarian who’s made a safe haven for big cats and a group of volunteers who have made looking after the regions feral cat population their mission. In this episode we bring you stories of organ donors and the people whose lives they saved. First, the story of a young man whose tragic passing saved the life of five others. Then a story on the need for African American bone marrow donors, followed by the efforts by a group of Transplant Guardian Angels at UPMC who help ease the anxiety of transplant patients and their families. We focus on the contributions of African Americans to our history and our future. Find out what people in the region are doing to celebrate the work of playwright August Wilson, then learn more about those who marched for their right to vote. We’ll meet a man who crossed racial lines in sports in 1950 and how he’s making a difference in Pittsburgh today before getting a look at an exhibit at the City-County Building aimed at honoring those who are paving the way for future generations. In this episode, we focus on artists. First, we’ll meet a man who is using his passion for art to pay tribute to his hometown of Braddock. Then we’ll hear the soulful sound of local singer and songwriter Bridgette Perdue before getting a lesson in improvisational dance from Gia Cacalano. We'll introduce you to this gifted dancer who now heads not one but two local dance companies. 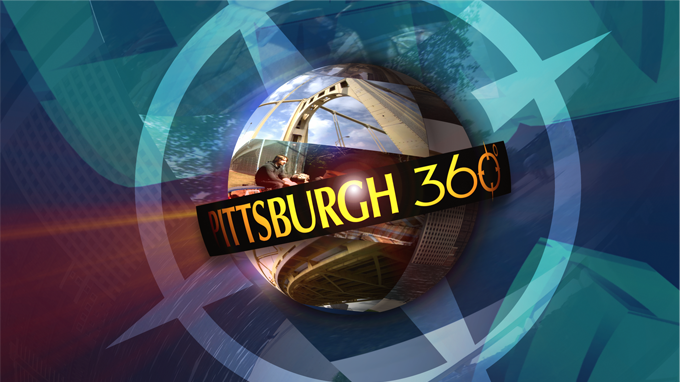 This episode of Pittsburgh 360 is all about education and the inventive ways in which educators are using technology to change the way students are learning. We begin at Elizabeth Forward Middle School where students are using tools like laser engravers and 3D printers in the classroom. Then we’ll go to a school in Butler County where students are advancing their skills in math, science and more through gaming. Finally, we get the look at the learning trend of digital badging.